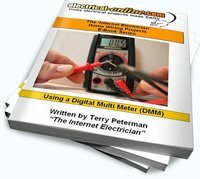 What do you do when the switch you are trying to replace doesn’t have a neutral conductor in the box? 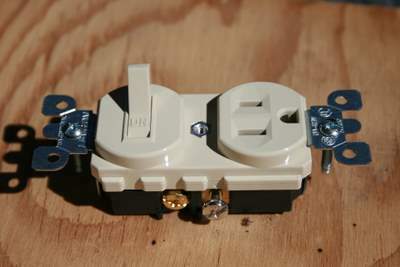 This article will discuss what steps you need to take to replace a light switch with a switch/receptacle combo device. This was a question from a client who was attempting to turn a switch in to a switch / receptacle combination device, but there was no neutral conductor in the box. Q: Hello. 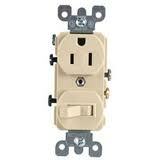 I am replacing the light switch in my garage, with one that has a switch and a single receptacle below it. I was pretty confident about the job until I pulled the old switch out. To my dismay, there is only two wires to the switch, a white (with a piece of black tape on it) and a black wire. I can get the new switch/receptacle to work for the light but not the receptacle. Can you tell me what I am doing wrong? Thanks. A: The problem here is that you have no neutral in this box. The switch is just a ‘switch leg drop’, so the power for the light comes in to the light box, and then there is a 2-wire drop down to the switch to turn the light on and off. In this situation, there is no need to send the neutral down to the switch as well. Without some additional wiring, you will not be able to accomplish this task. To learn how to wire a switch / receptacle combination device, and three common applications for wiring or connecting a receptacle/switch combo device in a circuit, check out this post on our site for more information. This entry was posted in Q & A and tagged combination device, device, how to wire a switch/receptacle, light switch, receptacle, switch, switch leg drop, switch/receptacle combination device. Bookmark the permalink.